The island of Bohol features a surprising number of unique highlights, given its small size. It’s home to the world’s smallest mammal, the Tarsier, it features over 1000 cone-shaped hills, the Chocolate Hills and it hosts one of the oldest churches in the Philippines. During my stay in Alona Beach, I decided to rent a car and a driver for the day to check out what this island in the Philippines has to offer. My friendly driver Larry arrived spot-on at 9am in the morning and off we were! 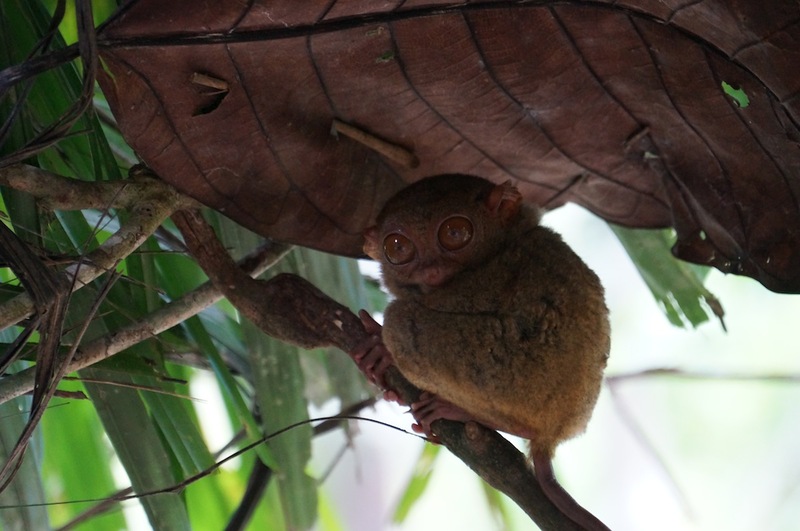 First stop, the Tarsier sanctuary, just over an hour drive from Alona Beach. This is a fenced off piece of jungle where a number of Tarsiers live. 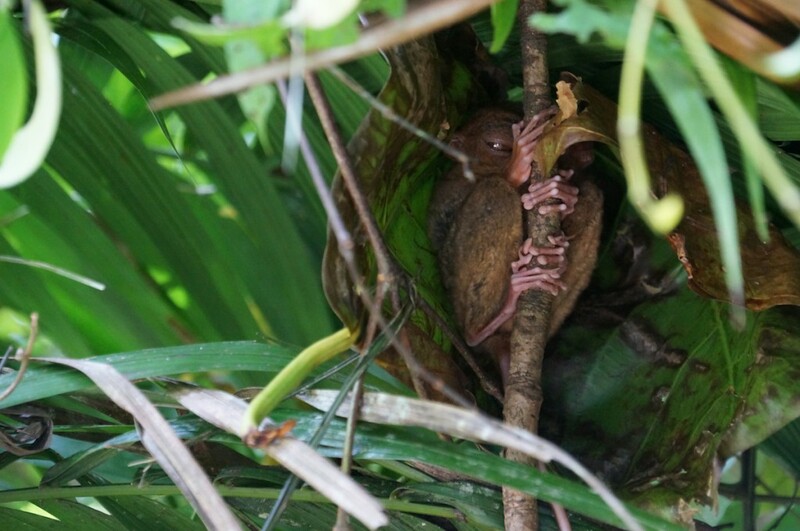 They are nocturnal, so during they day they clinch Koala-style to a tree branch to rest. They are really tiny and hard to spot. The sanctuary staff helps out by pointing out the spots where the big-eyed creatures tend to hide. They do have an extremely high cuteness factor and I kind of wanted to keep one as a pet. Next stop, the butterfly garden, just a few minutes drive from the Tarsier forrest. 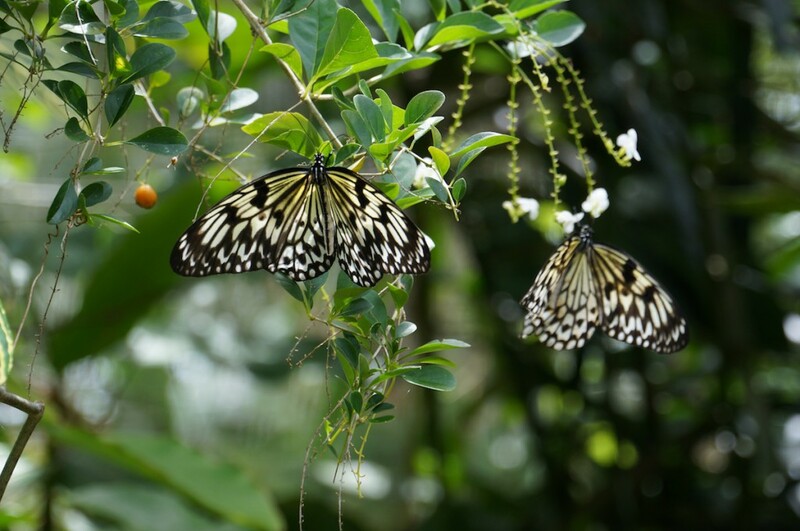 It features not just a garden, but also a museum type area where you can learn bout the live of a butterfly. It also showcases a number of caterpillars and cocoons, in various stages of their process of turning into a butterfly. Quite interesting actually. The guide that showed us around had a large inventory of way-to-cheesy jokes to fire at me, so I kind of rushed through the museum quickly to get away from him. 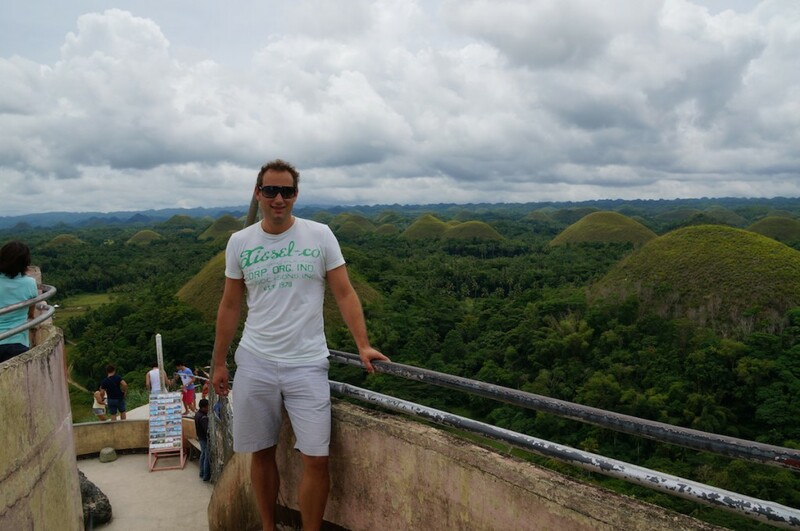 The Chocolate Hills are what Bohol is most famous for. I was taken to one of the many hills in the area that features a nice vantage point. A staircase has been installed to make the climb a little easier. After walking up the two-hundred steps, I got to enjoy quite a special view. 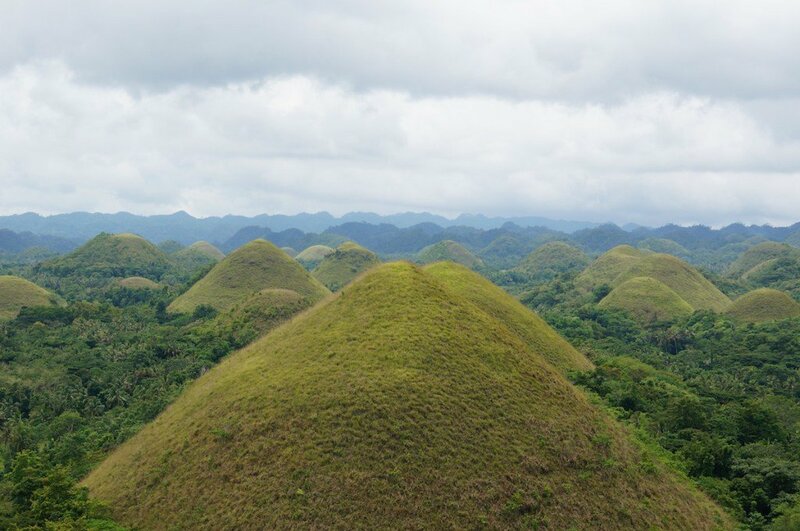 The Chocolate Hills form an interesting geological formation. 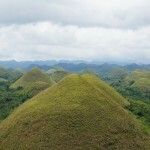 The cone shaped hills vary in sizes from 30 to 50 meters. Estimates of the total number of domes range from 1200 to 1700. I wondered where the hills got their name from. According to Larry, during the dry season the green hills turn brown as the grass dries up. Next up: river cruise including lunch. 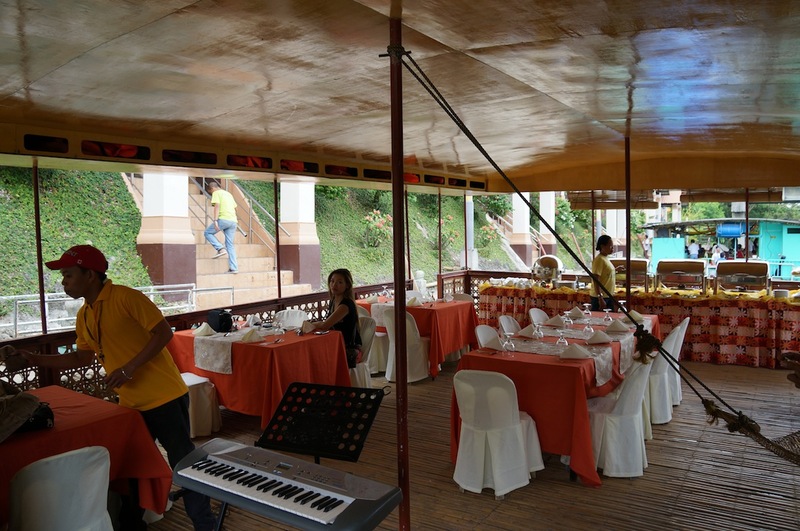 I could choose between ‘normal buffet’, at P350 or ‘premium buffet’, at P450. I opted for premium. After paying for the tickets, I was taken to a floating, barge type of boat, with a small engine powered sloop behind it. A small buffet had been setup and I was encouraged to start my lunch right away. Around me I saw at least ten other barges. The platforms almost formed a large chain. Soon after the boat started moving, we arrived at a floating platform with a large group of traditionally dressed dancers and musicians. 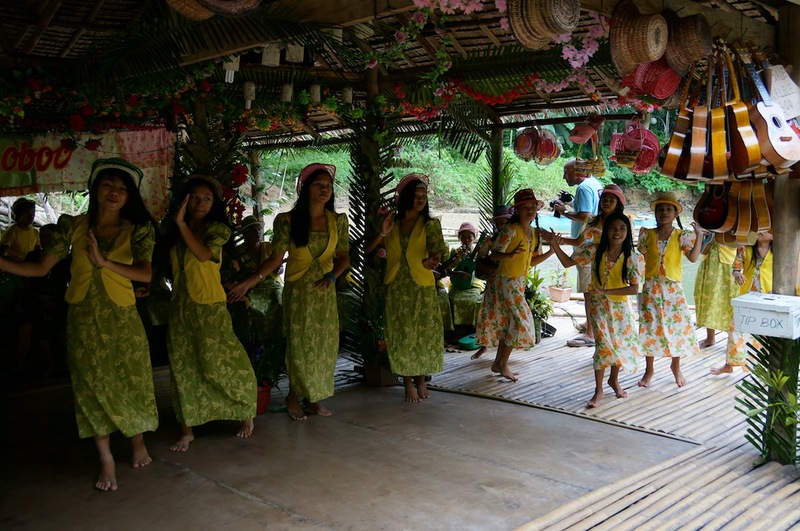 As the women played their mini-guitars and sang along some Filipino tunes, the kids danced in front. As you might expect, there wasn’t a shortage of tip boxes. A few hundred meters further down the river was a small waterfall. At this point we turned around and headed back to basecamp. This had been one of the cheesiest tourist activities I’ve ever taken part in. The most interesting part was really how the local tourism board managed to create such a popular tourist activity pretty much out of thin air. Quite impressive! 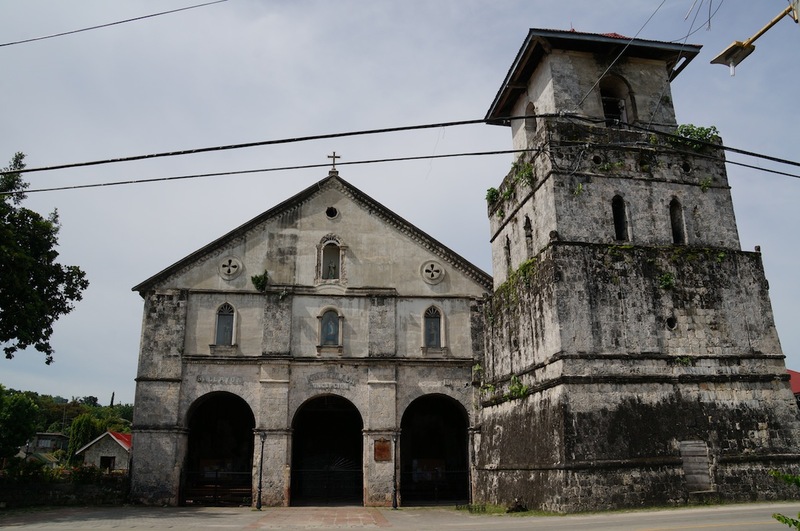 My last stop was at the one of the oldest Churches in The Philippines. Jesuit priests constructed the church in 1595 and it’s still intact today. I wondered how it managed to survive 400 years of hot, humid weather and the tropical storms and typhoons that hit the Philippines so often. The church is well worth a visit, it hosts some nice Roman Catholic relics and images. After visiting countless of Catholic churches throughout Europe, it’s interesting to visit one on a small island in the middle of the Pacific Ocean, thousands of miles away. Looking back it was definitely a day well spent. 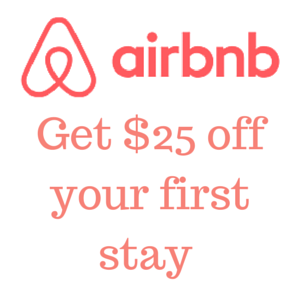 I would recommend all of the highlights except for the lunch on the river cruise; I think you’re better off finding a local restaurant and have lunch there instead. It’s just to cheesy and setup, food isn’t great, it’s too crowded and the river cruise itself doesn’t add that much in my opinion. Arent you used to tip boxes? Lol! Unfortunately, the Baclayon Church was destroyed by an earthquake last October 15, 2013. :/ Anyway, I love your blog! 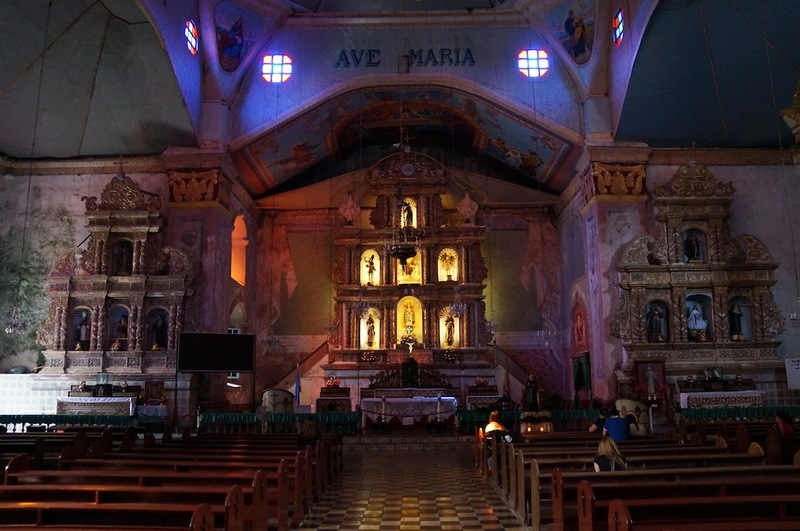 You are so lucky to visit the church before the earthquake destroyed it. Very true, I can’t believe it’s not there anymore, so sad.